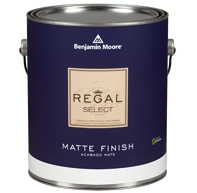 Benjamin Moore Premium Regal Select Interior is a low odor premium paint with high durability and great coverage. From Anonymous of Fayetteville, North Carolina on 3/6/2018 . From Jamey Royer of Beaumont, Texas on 1/7/2015 .